We live in a fast paced world where more and more people are finding it hard to get a good night’s sleep. Patients are always asking their Chiropractor how they can get more quality sleep. Getting seven to nine hours of sleep per night can relieve stress, improve cognitive function, memory, and reduce the risk of certain chronic diseases. Exercise regularly! Exercise helps to keep your body functioning and burns off excess energy. Make sure not to exercise too close to bed time as the elevated heart rate may keep you up. Drink warm, room temperature water at night if you are thirsty. Cold water may interfere with your digestive system. Get a sleep routine. Your routine should be replicated each night. Do similar activities before bed and try to get to bed at the same time to help your body get into a rhythm. Limit electronic screen time before bed. Bright screens interfere with the production of melatonin, the hormone responsible for our sleep/wake cycle, and can make it harder to fall asleep. Especially on our hot summer nights, it is important to keep your bedroom a cool temperature, and make the room as dark as possible. This will help your body calm after a busy day, and get ready for sleep. Watch your caffeinated beverage intake. Some people can be kept awake especially if they are consumed later in the day. How can chiropractic help you sleep better? Chiropractic is based on the premise that your body is self-healing and self-regulating. Chiropractors analyse the spine and remove interferences to the nervous system which inhibit its ability to function at its optimal state of well being. When the nervous system is functioning free of interference, all body systems work better, this can include sleep. Many people have musculoskeletal issues, neck and back pain, osteoarthritis, these conditions can negatively impact their quality of sleep. Through effective chiropractic care, patients may be able to get a comfortable night’s sleep and experience improvement in their quality of life. Get more quality sleep and you will have more energy to face whatever challenges life throws at you. 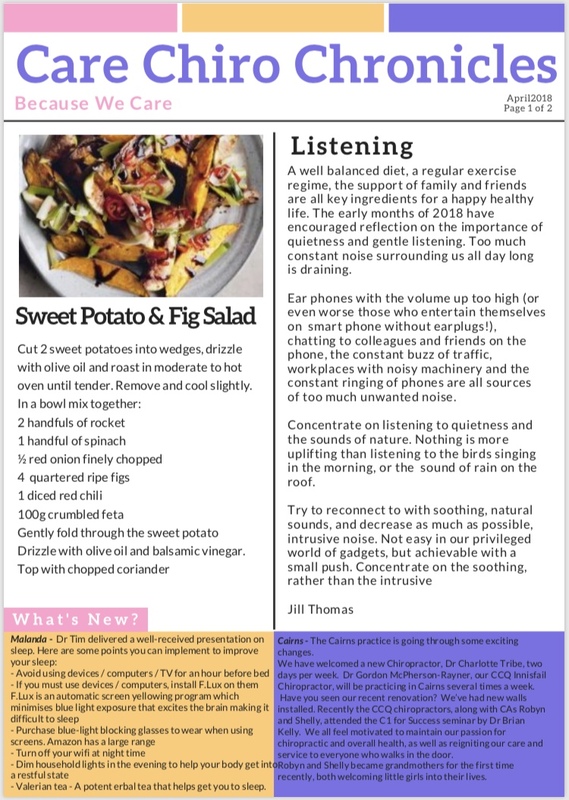 News from our Cairns, Mareeba, Malanda, and Innisfail practices, workshop dates, recipes, tips from the Chiropractors, and more! Pick up a copy of Care Chiropractic QLD's latest newsletter at your next appointment. Spinal fusion for unexplained back pain will today be put on the list of unnecessary, wasteful and risky medical procedures, promising patients more clarity over their options and potentially saving the health system tens of millions of dollar a year. The move comes after The Australian revealed health insurers had nominated a reduction in spinal fusion surgery as one of the doctor-led responses required to contain the rising costs that are driving up premiums. Even a 20 per cent reduction in hospital cases would save the industry $60 million a year, with flow-on savings for members. The Australian Prudential Regulation Authority has warned that insurers are “under duress” and more work needs to be done to reduce costs and stabilise the industry. Its latest figures, ­released yesterday, showed the proportion of Australians with hospital cover had fallen again, to 45.6 per cent, the lowest rate since mid-2011. While spinal fusion surgery may have a role in cases of spinal instability, in recent years it has often been used in an attempt to treat chronic low back pain where there is no obvious cause. Experts are alarmed by the trend and, ­according to one estimate, the surgery cost $2.3 billion over a ­10-year period despite more than half of those operations likely being unnecessary. The pain medicine faculty of the Australian and New Zealand College of Anaesthetists has now recommended that spinal fusion be added to the list of unnecessary procedures being developed through the professions-led ­initiative Choosing Wisely. The college is urging doctors not to refer patients with axial or mechanical lower back pain for spinal fusion surgery. It is one of five recommendations from the pain experts for the list, with some of the others being not to prescribe benzodiazepines for low back pain and to avoid prescribing opioids for patients in chronic non-cancer pain where the risks outweigh any benefits. The college’s Mick Vagg said yesterday it was hoped that by ­advising against spinal fusion surgery, clinicians and their patients would be able to focus on other options. Medibank has estimated that about 2000 of its members have spinal fusion surgery each year, costing just under $35,000 each. There is also a huge disparity in the rates of surgery, depending on where it takes place and whether in the public or private system. The Australian Commission on Safety and Quality in Health Care found variation by area on a factor of 6.9. It noted that spinal ­fusion surgery in NSW increased by 2 per cent between 1997 and 2006 in the public system — and by 167 per cent in the private ­sector. Private Healthcare Australia head Rachel David said spinal fusion was another example of where evidence-based medicine helped patients and the system. APRA figures show the level of hospital treatment benefits paid by insurers was 4.7 per cent higher in the December quarter than the same period the year before. But the average out-of-pocket cost for patients in that period increased 6.1 per cent. Dr David said health insurers returned more of their premiums to members than any other insurance category. She suggested the figures would also put lie to the claims, most recently made by Labor leader Bill Shorten, that some health insurers were making 25 per cent profits, in comments that appeared to reflect he confused a return on equity measure with profit. “Health fund profit margins were 5.16 per cent in the 12 months to December 2017 and health fund profits have remained stable over the last decade running between 4.5 and 6 per cent, significantly below the returns made by private hospital groups and medical specialist practices,” she said. The continued slide in the proportion of Australians with hospital cover — 12,294 fewer members in the quarter — came after Health Minister Greg Hunt announced a package of reforms and before he approved long-time low premium increases.